Sushi has always been one of my favorite foods on the planet. The mini bites of different flavors, unique combinations, and decadent raw fish just make it one of the most fun eating experiences, in my opinion! What’s amazing about sushi is that it’s so versatile, and completely possible to make raw or Paleo! 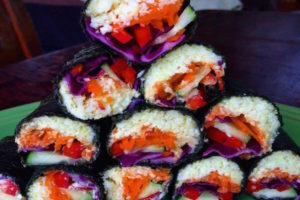 Since I’m in Costa Rica for a month of raw vegan detox, I was sure that these nori rolls would be good – but just not the same without the fish. You know what though – the simple yet powerful flavor combo and fun textures made this a vegan meal that was more than satisfying! And what’s really unbelievable is how much the cauliflower rice tastes just like sushi rice, but with a ton more health benefits. Rice and other starchy carbs clog up our digestive system and leave us feeing sluggish and with our blood sugar levels zipping all over the place. Processed in the food processor, the cauliflower takes on the exact texture of rice, and is flavored with delicious coconut vinegar and curry for a unique twist on regular sushi rice. These nori rolls were such a loving process to make – it’s so amazing to spend such time on a meal, prepping the different parts, then to put it all together and enjoy with love! I highly recommend putting these together, ASAP. First, let’s make the cauliflower rice. Blend the cauliflower up in the food processor until it reaches a rice-like consistency. You might want to do a little bit at a time then set aside to blend more. Then, place all of the cauliflower rice in a big bowl. Add lime juice, curry powder and coconut vinegar; set aside. Place all ingredients for tahini in blender or Vitamix, blend until it reaches smooth consistency. In a small dish, mix the coconut amino acids, coconut oil and grated ginger. Set aside. Now it’s time to put together our rolls! Lay out a nori roll and spread a thin layer of tahini, followed by a layer of cauliflower rice. Lay the carrots, cucumber, cabbage and red peppers down next in a line. Dab a bit of water on the far end of the nori sheet, then roll up! Once you have the roll made, dip a serrated knife in water to cut the rolls. Serve with both sauces, and enjoy!